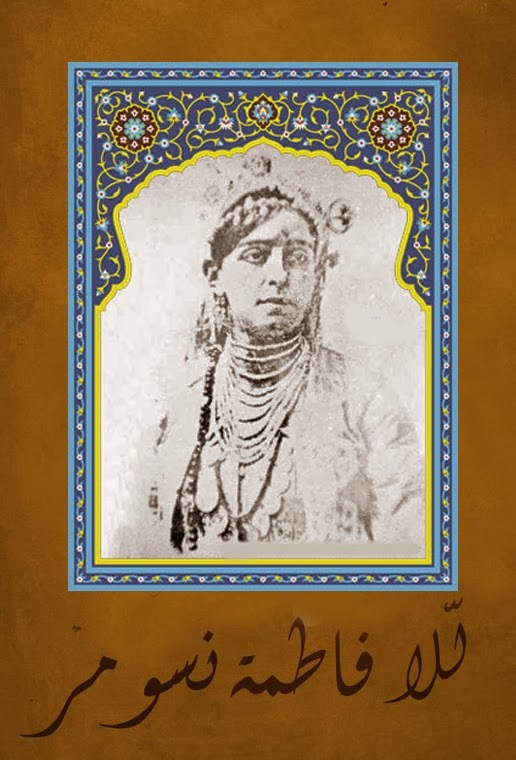 Lalla Fatma N'Soumer, heroine of the Djurdjura, was born in a village near Ain El Hammam in 1830, the year when the French occupied Algeria. Her real name was Fatma Sid Ahmed. The nickname, NSoumer, was given to her because of her strength and because she lived in the village of Soumer. Fatma's father was the head of the Quranic School, which was linked with the Zawyia Rahmaniya of Sidi Mohamed Ibn Abderrahmane Abu Qabrein. At a young age, Fatma memorized the Qur'an, simply by listening to her fathers disciples when they chanted the various surats (chapters). Those close to her described her as having a stupendous memory and being greatly gifted. After her fathers death, Fatma directed the Quranic school with her brother, Si Mohand Tayeb. She took special care of the children and the poor. In addition to her great piety, her notable wisdom, and piercing intelligence, she had an excellent reputation throughout the region of Kabylia. Fatma NSoumer was only sixteen years old when French soldiers occupied Kabylia. The region was taken like the country's other regions, not without violent fighting. But the insurrection led by Lalla Fatma NSoumer remains one of the most important because of this lady fighters bravery and nobility. The enemy referred to her as the Joan of Ark of the Djurdjura, a comparison that the religious Fatma NSoumer did not accept. Armed with an unshakable faith, she threw herself in bloody battles to push back the enemy. In Oued Sebaou, in 1854, when Fatma was 24 years old, she gave the French army (several times her superior in number and supplies) a lesson in courage and determination. 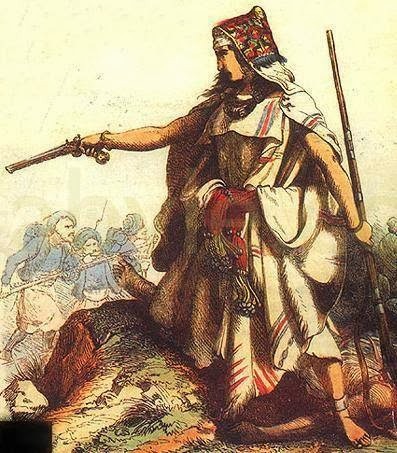 During this famous battle, led by Mohamed El Amdjed Ibn Abdelmalek (nicknamed Boubaghla), who almost gave the French troops the advantage, Fatma, heading an army of men and women, took control and led her people to victory, a victory that was heralded throughout Kabylia. The mosques, zawiyas, and Quranic schools burst into chants of praise in honor of the heroine of the Djurdjura. General Randon, who did not accept this defeat, asked the inhabitants of Azazga to help him reach Fatma NSoumers quarters and to end "her legend and misdeeds." The response to his emissary was to "Go to the one who sent you, and tell him our ears cannot hear the language of he who asks us to betray." The reaction of the general in turn was that "as long as they remain deaf to our appeals, I will make them hear the sound of our cannons." Fatma NSoumer did not give up. Even after the fall of Azazga and the ferocious repression by Randons troops, she mobilized the population and led more battles. She called her people to "fight for Islam, the land, and liberty. They are our constant, and they are sacred. They can neither be the object of concessions nor haggling." Her strong personality had a strong influence on all of Kabylia, shown by the sacrifice and determination of the people during all the battles, especially those of Icherridene and Tachkrit, where the enemy troops were greatly defeated. The latter took place on July 18, 1854, and resulted in a heavy toll for the enemy: 800 dead of which 56 were officers and 371 injured. Randon finally asked for a cease-fire, which was accepted by Fatma NSoumer, a political and military strategic decision. She planned to use the period of the cease-fire to improve her organization and reinforce her troops. The fields were plowed and sowed, and arms factories were installed in all corners of the region. However, this cease fire, like other signed cease fires and treaties, like those with Emir Abdelkader, was not respected by the French. After three years, in 1857, they broke their word after having prepared their armies and launched offensives against several large cities which where, until then, difficult to overtake. Fatma NSoumer, whose influence motivated the fighters for freedom, appealed to the people for a last and supreme effort. It was a matter of occupying three strategically important positions. Surrounded by women of the region, Lalla Fatma directed the fight and encouraged the volunteers who remained. The battle was lost, however. In the same year, Fatma was arrested, imprisoned in the Issers then in Tablat. The French soldiers spent her fortune, which had been used toward caring for the disciples of her brothers zawiya. Her rich library, which contained a rich source of scientific and religious works from the region, was completely destroyed. 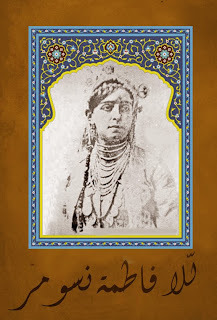 Lalla Fatma NSoumer died in 1863. The hardship from her incarceration and the frustration from her inability to act against the aggressions and insults to which her people were submitted, affected her so deeply that her health deteriorated. She was only 33 years old. Pouvez-vous retirer cette photo qui n'a aucun rapport avec LA Chahida Lalla Fatma N'soumer, Ellah yarhamha. La photo prise par un photographe suisse Jean Geiser est une insulte à la mémoire de la chahida morte dans les geôles françaises .